We look forward to seeing all our friends at #DENstartupweek. We will be at the Opening Party on Monday night, and otherwise we will be based out of Commons on Champa aka Basecamp. We’re thrilled to see such progress in Denver among key indicators such as the total number of startups and employees at startups growing dramatically, and of course the amount of money raised increasing to nearly 600MM in the past year. 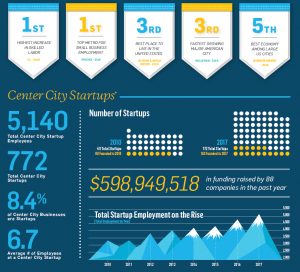 You can see the specific stats put out by our friends at Downtown Denver Partnership in the attached infographic. Our favorite stat is according to Paychex, Denver is now the best metro area in the US for small business employment. Super cool. It’s so gratifying to see Colorado embracing entrepreneurship more and more every year. We look forward to seeing you at DSW18 and be sure to stop us and grab one of our new Startup Week stickers!